I love homeschooling. I think I’ve mentioned that here before. I love it for several reasons…. one of them being the freedom to make and follow (or not) your own schedule. So, way back in August when our co-op moms were deciding on Spring Break, we picked the first week of April. That sounded good to all of us. Done. Bam. Then last week we got a call from my husband’s brother asking if we wanted a week of company for their Spring Break. SURE! So today wrapped up Spring Break #1. Next week starts Spring Break #2, only because it was already on the schedule and we don’t have to go to class on Wednesday as per usual. The Crosby’s will be doing school work, but it will be a tad relaxed. And everybody said…. AMEN! Spring Break #3 will be later in April, when our son has a cycling race in Monterey. We don’t plan to bring any school work on that trip either. I did alert the pupils that the same amount of math, history and English will need to be done by the end of Spring Break #3…. in order to keep the water flowing in the primed schoolwork pump. See why I love homeschooling? Here is a photo tribute to spring Break #1, 2012. 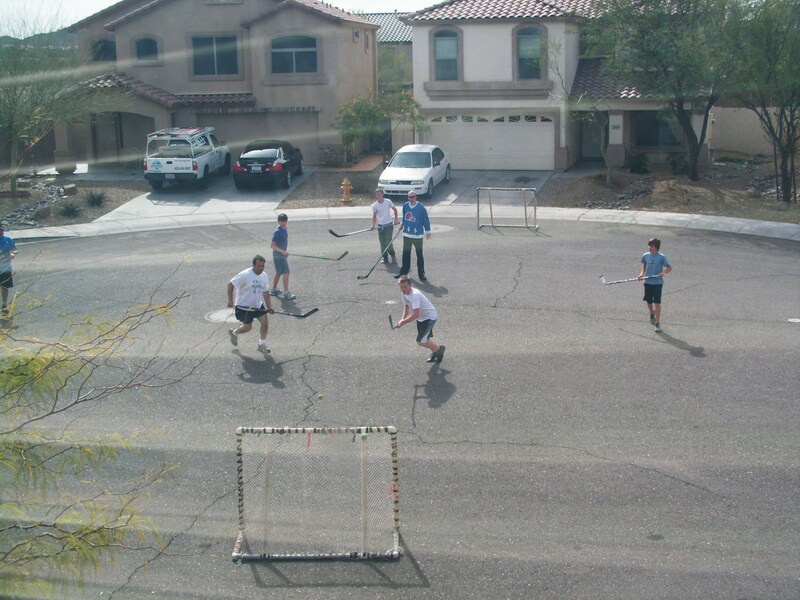 Street Hockey Championship in the cul-de-sac. 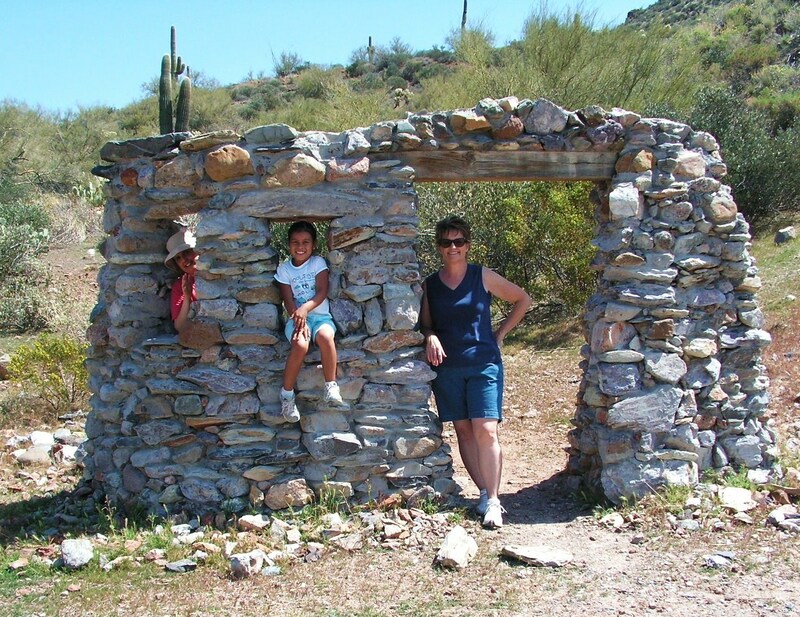 The Metate Trail in the Spur Cross Recreational Area…. 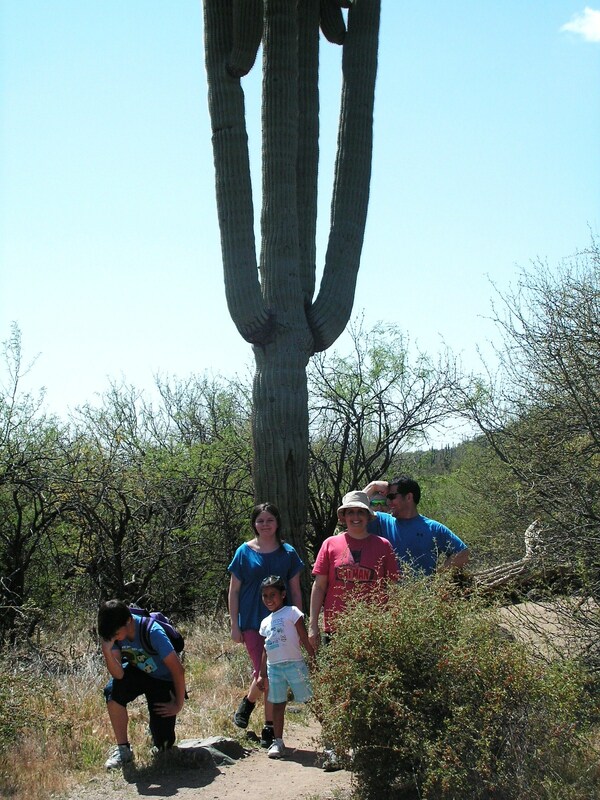 HUGE saguaros! 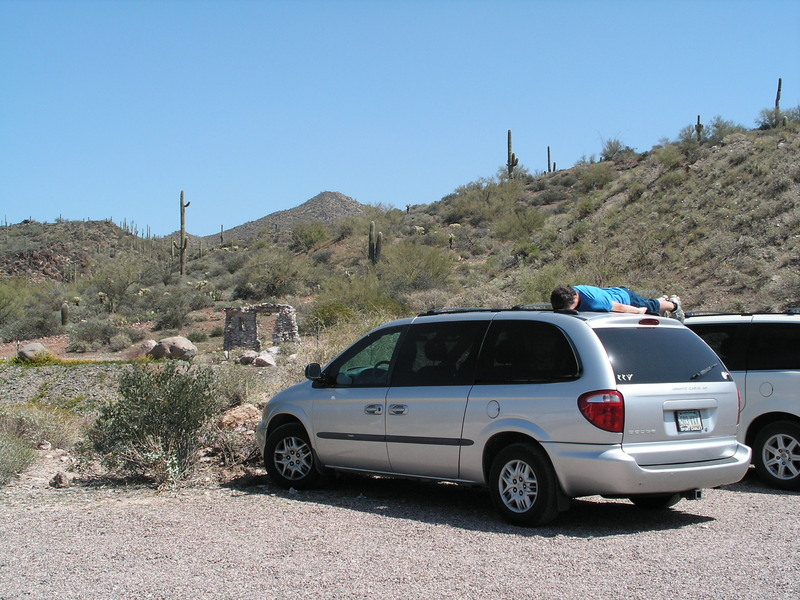 What would a hike be without some planking? And to finish off hike #1…. some ruins. 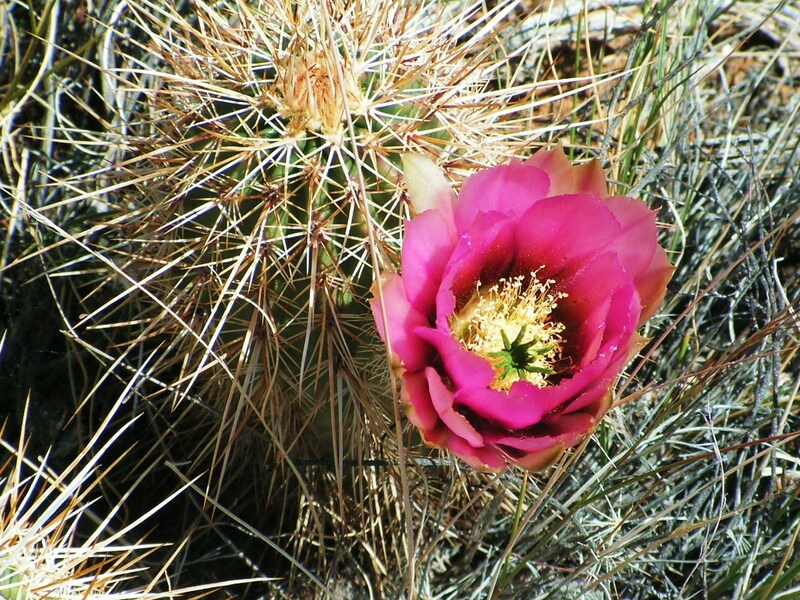 The cacti are just beginning to bloom their AMAZING blossoms. 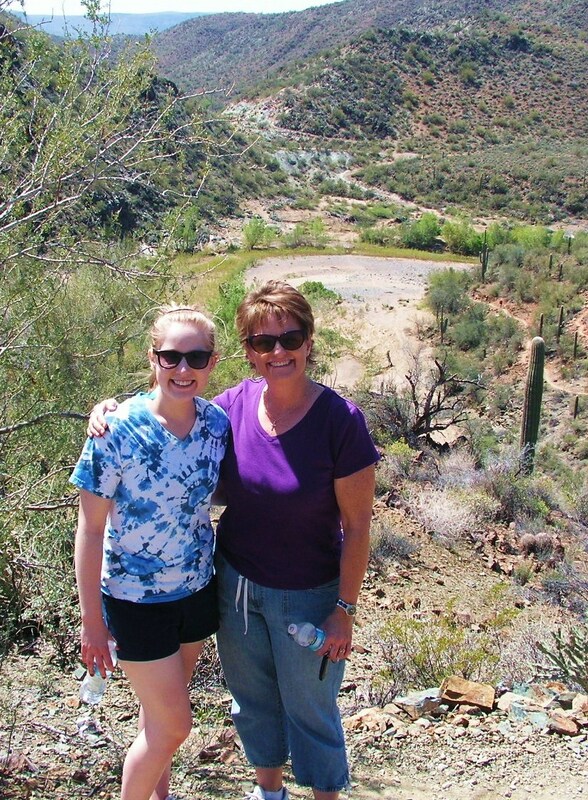 And we discovered there was a river at the bottom of the trial….. that we didn’t plan on… in time, water or food… so we will return to this hike someday when we are prepared. 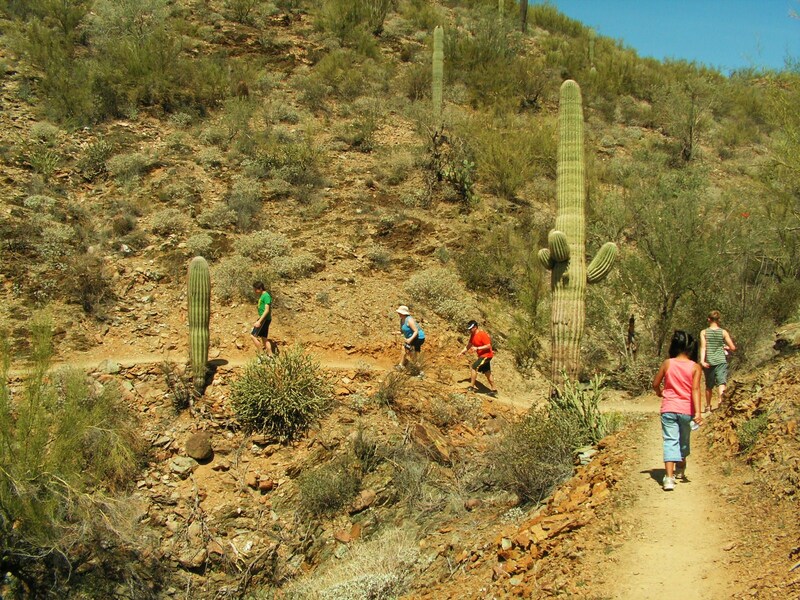 We were getting a bit concerned here in Phoenix last week when the Spring Break temperatures passed 90*F. Yikes. Those are not March numbers! I tried not to think ahead to the summer of sweltering days and stuffy nights. All five of us got sunburned in one area or another while fishing at the river. We all put on sunscreen… but obviously not very effectively. I have distinct red triangles on the tops of my feet. Larisa was wearing water shoes, so she is only burnt in little circles around her ankles. Keeve put on sunscreen and then changed shirts to one with a larger neck hole… so he has a crimson necklace. Austin’s shoulders and neck got kissed by the sun. And I’m not sure Rick ever used sunscreen, but his skin tans so quickly, he never turned red… before the lovely bronze color emerged. Good news appeared outside this morning on our thermometer… 55*F… oh, thank you, Jesus. It’s actually chilly in our house. While I read to the boys, one curled up in a blanket and the other went and changed from shorts to pants. Yes, it’s sunny, and yes, summer is still going to burn our bare feet, but for today… it’s a lovely March crisp day outside. It’s 1:00 now and we’ve only made it to 65*F. Perfect outside activity weather. LOVE THIS! OK, I just need to start by saying that I will NEVER sleep on the dirt again, as long as I have all my faculties and am conscious of where I am lying. We left for camping yesterday. We came home from camping today. The timing couldn’t have been better for my aching bones. Thankfully it was only an hour from home and the campsite was lovely. I probably woke up 20 times last night… and every time I did I would think, “OH good! That means I actually fell asleep for a little bit.” I’m even a positive thinking when half conscious. The first time I opened my eyes and could see past my hand, I was out of that tent and off to the river to catch lunch. Austin was right behind me and we made so much noise getting dressed, that Larisa came too. Did we catch fish? No. We did catch other things. And we know there were plenty of hungry fish in the Verde River because they taunted and teased us all day long by jumping out of the river to show us that they were there. They even jumped within 6 feet of where I was standing… casting and reeling… casting and reeling. And in case you are planning a fishing excursion to the Verde River at Needle Rock Campground, the fish do not eat the following things on hooks: power bait in green or pink, marshmallows, corn, bacon, potatoes, scrambled eggs, ramen noodles (hard or soft), and by the way, the little piece of red fabric tied to the lure didn’t seem to help either. We did eat fabulous food for camping: steak shish-kabobs with rice, jiffy pop (told you! ), breakfast hash, Chinese Chicken salad and of course smores. As usual, we came up with a famous Crosby lines from our trip. (This is a family custom, so we will always have these inside jokes about our trips together.) This trip’s line was Keeve’s answer to “When do you want to go home?” It was discussed that we would leave at about 6:30 or 8:30 pm after another campfire dinner and family time around the burning wood. The kids were asked at 2:00 when they wanted to go home, meaning, 6:30 or 8:30…. Keeve’s answer: “How ’bout 30 minutes.” He did have fun, but was stuffed up the whole trip and then got a rash on his legs from his wet bathing suit. :o( Poor boy. You want pictures???? Of course you do! What in the world is the last picture? You ask? It’s the place where the midnight prowler scared the beegeebeez out of us. We were sitting around the fire singing songs (Not Kumbaya either). Cool songs like Islands in the Stream and some Kutless songs. Anyway, I made everyone stop singing because I could hear something walking in the bushes. At first my dear family mocked me and called me names like Chicken Little, Scaredy Cat and Lilly Livered. But when the Coleman lantern lit up the weeds and they all saw them move, everyone except Rick and I was up on the picnic table in 2 seconds flat. Rick and I chucked large rocks at the moving weeds and eventually it stopped. But we took this picture for proof! See how it’s all smashed down! Proof! We just finished a unit of Floating and Ships which we wrapped up by renting a boat and spending the morning on Canyon Lake. It is amazing to me that there are beautiful lakes only an hour outside of Phoenix. Canyon Lake is one of a chain of three man-made lakes that fill steep canyons bordered with cliffs, cactus and even mountain goats. This is the perfect time of year to go because it’s not too hot yet. It was 65F when we arrived and 80F when we left. I’m not sure who loved it more, the moms or the kids? We decided we needed to plan some more units that would involve boating…. like animals of the Southwest, plants of the Southwest, classification of rocks, water conservation, gas propulsion, the sun’s effect of exposed skin, etc. As you can see, there are plenty of times we can return to the calm waters of Canyon Lake. It was a relaxing morning to kick off Spring Break. On the way home, we stopped at a ghost town of an 1893 gold mine. What a tourist trap…. but the kids had fun kickin’ up the dirt and talkin’ like cowboys. 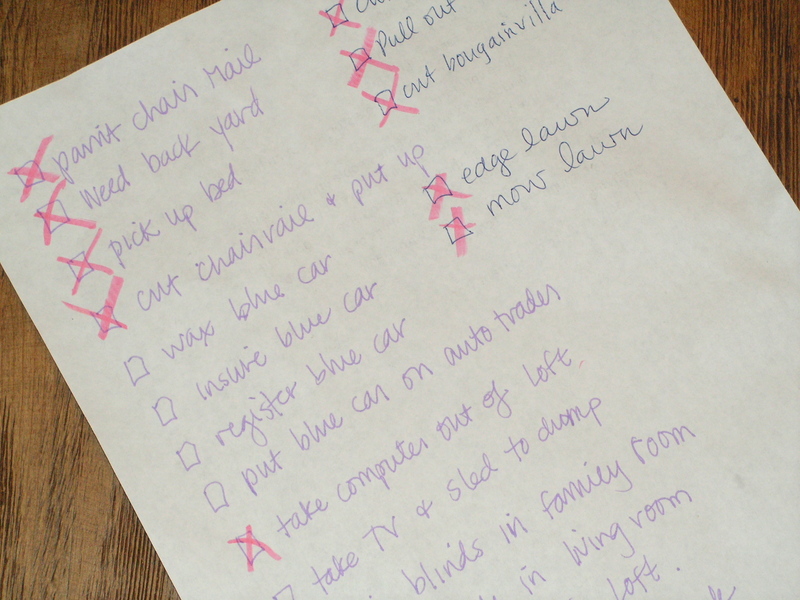 Spring Break is a sweet gift to homeschooling moms. Makes me smile.